Update: The Acme Grub Cage closed Aug 5, 2017. 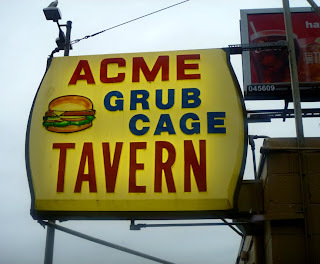 How can you resist a place called the Acme Grub Cage? This is a fairly typical, medium-sized, neighborhood dive, with beer company decor mixed with Halloween decorations. They have some interesting beers, a stage area for live bands, Twister, and a stripper pole. Rob the bartender told me the Grub Cage has been around since 1932 (this would, of course, been during Prohibition), and that it moved to its current location sometime in the 40s or 50s. New owner Steve Campagna apparently cleaned the place up considerably a few years ago. Re-opened as the Camp Bar.